↑ Birtle, Andrew J. (2000). The Korean War: Years of Stalemate. U.S. Army Center of Military History, 34. Retrieved on 14 December 2007. ↑ Young, Sam Ma (2010). "Israel's Role in the UN during the Korean War". Israel Journal of Foreign Affairs 4 (3): 81–9. http://www.israelcfr.com/documents/4-3/4-3-6-YoungSamMa.pdf. ↑ (1998) Symbol and Ritual in the New Spain: the transition to democracy after Franco. Cambridge: Cambridge University Press, 32. ISBN 0521628857. ↑ 5.0 5.1 (2006) Korean War Almanac, Almanacs of American wars. New York: Infobase Publishing, 528. ISBN 9780816074679. ↑ Kocsis, Piroska (2005). "Magyar orvosok Koreában (1950-1957)" (in Hungarian). Budapest: Magyar Országos Levéltár. http://www.archivnet.hu/politika/magyar_orvosok_koreaban_19501957.html. Retrieved on 22 November 2016. ↑ "Romania's "Fraternal Support" to North Korea during the Korean War, 1950–1953". Wilson Centre. http://www.wilsoncenter.org/event/romania%E2%80%99s-%E2%80%9Cfraternal-support%E2%80%9D-to-north-korea-during-the-korean-war-1950-1953. Retrieved on 24 January 2013. ↑ Tim Kane (27 October 2004). "Global U.S. Troop Deployment, 1950–2003". Reports. The Heritage Foundation. http://www.heritage.org/research/reports/2004/10/global-us-troop-deployment-1950-2003. Retrieved on 15 February 2013. Ashley Rowland (22 October 2008). "U.S. to keep troop levels the same in South Korea". Stars and Stripes. http://www.stripes.com/news/u-s-to-keep-troop-levels-the-same-in-south-korea-1.84294. Retrieved on 16 فروری 2013. Colonel Tommy R. Mize, United States Army (12 March 2012). "U.S. Troops Stationed in South Korea, Anachronistic?". United States Army War College. Defense Technical Information Center. http://www.dtic.mil/cgi-bin/GetTRDoc?AD=ADA562829. Retrieved on 16 February 2013. Louis H. Zanardi; Barbara A. Schmitt (August 1991). "Military Presence: U.S. Personnel in the Pacific Theater". Reports to Congressional Requesters. United States General Accounting Office. http://www.gao.gov/assets/160/150991.pdf. Retrieved on 15 February 2013. "UK-Korea Relations". British Embassy Pyongyang. Foreign and Commonwealth Office. 9 February 2012. http://ukindprk.fco.gov.uk/en/about-us/working-with-dprk/uk-korea-relations. Retrieved on 16 February 2013. "When war came to Korea in June 1950, Britain was second only to the United States in the contribution it made to the UN effort in Korea. 87,000 British troops took part in the Korean conflict, and over 1,000 British servicemen lost their lives"
Jack D. Walker. "A Brief Account of the Korean War". Information. Korean War Veterans Association. http://www.kwva.org/brief_account_of_the_korean_war.htm. Retrieved on 17 February 2013. "Other countries to furnish combat units, with their peak strength, were: Australia (2,282), Belgium/Luxembourg (944), Canada (6,146), Colombia (1,068), Ethiopia (1,271), France (1,119), Greece (1,263), Netherlands (819), New Zealand (1,389), Philippines (1,496), Republic of South Africa (826), Thailand (1,294), Turkey (5,455), and the United Kingdom (Great Britain 14,198)." ↑ "Land of the Morning Calm: Canadians in Korea 1950 – 1953". Veterans Affairs Canada. Government of Canada. 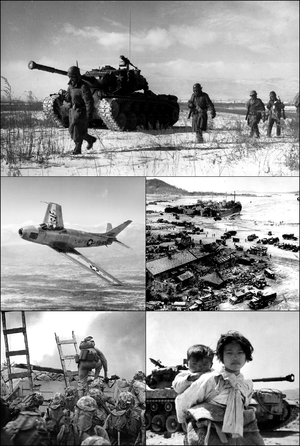 7 January 2013. http://www.veterans.gc.ca/eng/collections/korea/didyouknow. Retrieved on 22 February 2013. "Peak Canadian Army strength in Korea was 8,123 all ranks." ↑ 15.0 15.1 15.2 Edwards, Paul M. (2006). Korean War Almanac, Almanacs of American wars. Infobase Publishing, 517. ISBN 9780816074679. Retrieved on 22 February 2013. ↑ Kolb, Richard K. (1999). "In Korea we whipped the Russian Air Force". VFW Magazine (Veterans of Foreign Wars) 86 (11). http://www.highbeam.com/doc/1P3-43694886.html. Retrieved on 17 فروری 2013. "Soviet involvement in the Korean War was on a large scale. During the war, 72,000 Soviet troops (among them 5,000 pilots) served along the Yalu River in Manchuria. At least 12 air divisions rotated through. A peak strength of 26,000 men was reached in 1952.". ↑ 20.0 20.1 "U.S. Military Casualties – Korean War Casualty Summary". Defense Casualty Analysis System. United States Department of Defense. 5 February 2013. https://www.dmdc.osd.mil/dcas/pages/report_korea_sum.xhtml. Retrieved on 6 February 2013. ↑ "Summary Statistics". Defense POW/Missing Personnel Office. United States Department of Defense. 24 January 2013. http://www.dtic.mil/dpmo/summary_statistics/. Retrieved on 6 February 2013. ↑ "Records of American Prisoners of War During the Korean War, created, 1950 – 1953, documenting the period 1950 – 1953". Access to Archival Databases. National Archives and Records Administration. http://aad.archives.gov/aad/series-description.jsp?s=488. Retrieved on 6 February 2013. "This series has records for 4,714 U.S. military officers and soldiers who were prisoners of war (POWs) during the Korean War and therefore considered casualties." ↑ 23.0 23.1 Office of the Defence Attaché (30 September 2010). "Korean war". British Embassy Seoul. Foreign and Commonwealth Office. http://ukinrok.fco.gov.uk/en/about-us/working-with-korea/defence-relations/korean-war. Retrieved on 16 February 2013. ↑ "Korean War WebQuest". Veterans Affairs Canada. Government of Canada. 11 October 2011. https://web.archive.org/web/20130130062836/http://www.veterans.gc.ca/eng/teach_resources/korwebquest/grp02/korsum. Retrieved on 28 May 2013. "In Brampton, Ontario, there is a 60-metre long "Memorial Wall" of polished granite, containing individual bronze plaques which commemorate the 516 Canadian soldiers who died during the Korean War." "Canada Remembers the Korean War". Veterans Affairs Canada. Government of Canada. 1 March 2013. https://web.archive.org/web/20121006110456/http://www.veterans.gc.ca/eng/history/KoreaWar/koreawar_fact. Retrieved on 27 May 2013. "The names of 516 Canadians who died in service during the conflict are inscribed in the Korean War Book of Remembrance located in the Peace Tower in Ottawa." ↑ Aiysha Abdullah; Kirk Fachnie (6 December 2010). "Korean War veterans talk of "forgotten war"". Canadian Army. Government of Canada. https://web.archive.org/web/20130523072128/http://www.army.forces.gc.ca/land-terre/news-nouvelles/story-reportage-eng.asp?id=4854. Retrieved on 28 May 2013. "Canada lost 516 military personnel during the Korean War and 1,042 more were wounded." "Canadians in the Korean War". kvacanada.com. Korean Veterans Association of Canada Inc.. http://www.kvacanada.com/canadians_in_the_korean_war.htm. Retrieved on 28 May 2013. "Canada's casualties totalled 1,558 including 516 who died." "2013 declared year of Korean war veteran". MSN News. The Canadian Press. 8 January 2013. http://news.ca.msn.com/canada/2013-declared-year-of-korean-war-veteran. Retrieved on 28 مئی 2013. "The 1,558 Canadian casualties in the three-year conflict included 516 people who died." ↑ Ted Barris (1 July 2003). "Canadians in Korea". legionmagazine.com. Royal Canadian Legion. https://web.archive.org/web/20130720042136/http://legionmagazine.com/en/index.php/2003/07/canadians-in-korea/. Retrieved on 28 May 2013. "Not one of the 33 Canadian PoWs imprisoned in North Korea signed the petitions." ↑ "Two War Reporters Killed". The Times (London, England). 14 August 1950. ISSN 0140-0460. ↑ "180,000 Chinese soldiers killed in Korean War, says Chinese general". China Daily, 28 June 2010. State Council Information Office, Chinese government, Beijing. "According to statistics compiled by the army's medical departments and hospitals, 114,084 servicemen were killed in military action or accidents, and 25,621 soldiers had gone missing. The other about 70,000 casualties died from wounds, illness and other causes, he said. To date, civil affairs departments have registered 183,108 war martyrs, Xu said." ↑ "US State Department statement regarding 'Korea: Neutral Nations Supervisory Commission' and the Armistice Agreement 'which ended the Korean War'". ↑ "North Korea enters 'state of war' with South".